You know what happens when you take your grandchildren to their swimming lessons at a local high school? As a quilter, I'll tell you what happens. You see this tile by the outdoor shower that of course inspires a quilt. What happens next when you are following Christopher Thompson, aka The Tattooed Quilter, and he comes out with a fabric line called Blue Carolina for Riley Blake, with a lovely range from white backgrounds to navy backgrounds? You just know it is going to be the perfect collaboration. You quickly cut a stack of squares from each of the fabrics and start playing with them on the design wall. The next thing you know, you have this. It goes together quickly, and soon it's ready to be quilted and bound. Darby chose the perfect wavy quilt design. The obvious choice to photograph the quilt is of course at the site of the original inspiration, the high school aquatic center. The problem: I can't very well just walk in and photograph a quilt there. But I have a connection, Diane. She graciously contacts someone with keys and we meet at the appointed time, 11 a.m. We took photographs in full sun but I was happy for the opportunity. 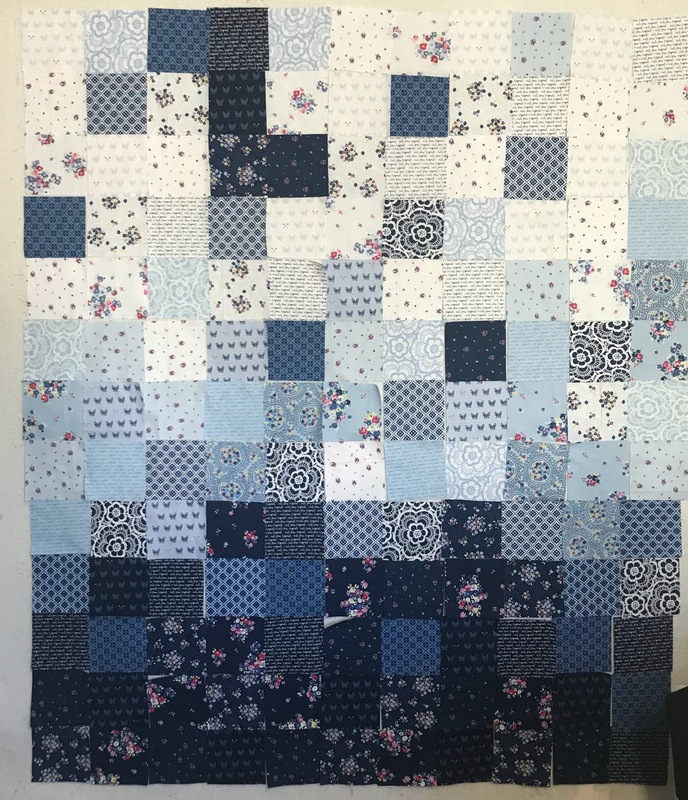 It was a fun quilt to make and I was happy that it turned out as I visualized it. Quilt Size: 55" x 65"
I'm crazy about one-patch quilts. I need to do more of them, especially if they would turn out as terrific as this one!